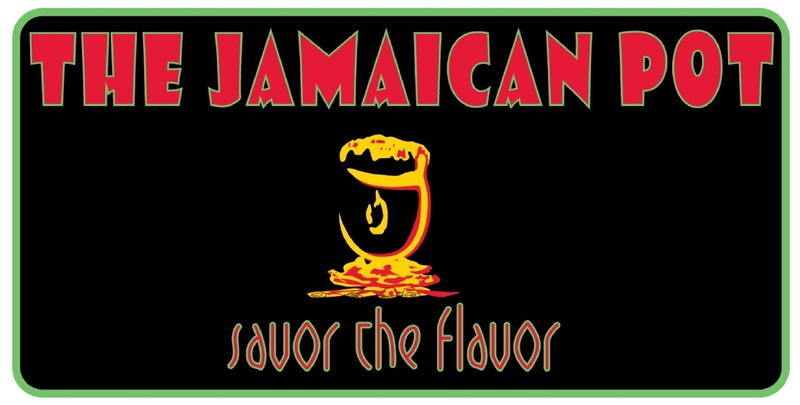 The Jamaican Pot is a new Caribbean restaurant located in Southfield MI. Located inside the Culinary Studio a shared use kitchen, at the Applegate shopping center. 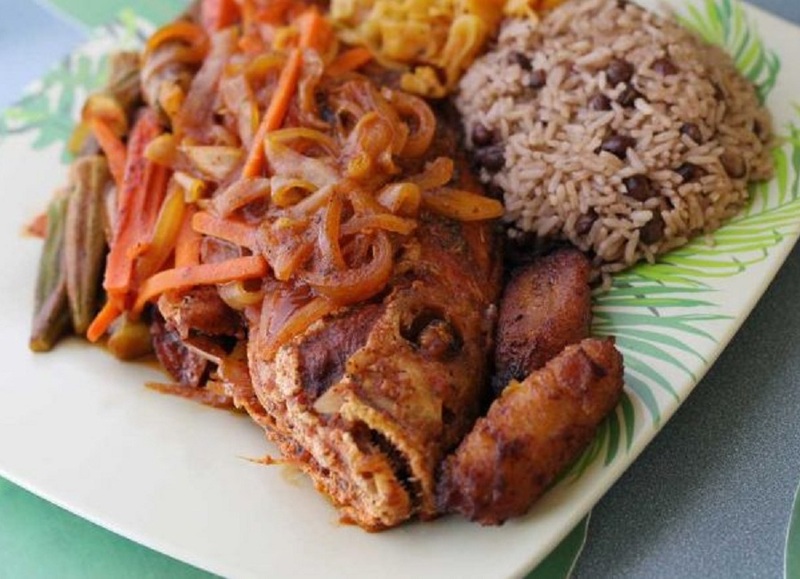 Our cook Rosemarie, was born and raised in Westmoreland Jamaica. By the age of 8, she was already an accomplished expert at preparing and flavoring food. She eventually moved to the states. And after her college years, finally settled in NYC. From there she moved to Atlanta and soon began selling food at west Indian carnivals in several east coast states. And now having settled in MI. she has become a top notch caterer. And with the help of the Culinary Studio is now poised to present to you, some of the best tasting food on earth. 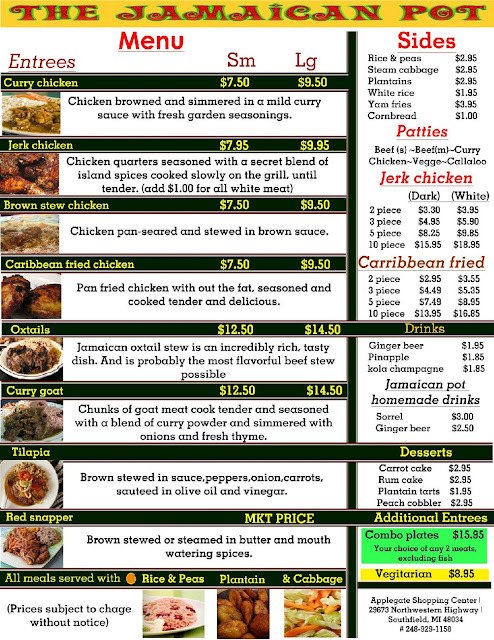 This is a Jamaican food restaurant and i have eaten in many from NYC to Jamaica it's self, including a few in Detroit. But i have never tasted anything like this one. The flavor of the food is outstanding , i had the Jerk chicken which came with Rice & peas, plantain and cabbage. Every bite was a trip to heaven, the plantains were sweet, the cabbage was not over cooked and the jerk although spicy was favorable and not over powering. My only problem with this restaurant is they are currently open for 3 days only, Friday & Saturday and Sunday. Well until they add more days, i know were i well be spending my weekends. I love this food!I've been ordering take out from this restaurant every weekend.The people have great customer service skills!I can't wait until they're open everyday!!!!EXCELLENT! Upon entering the establishment I was greeted with a warm friendly smile. 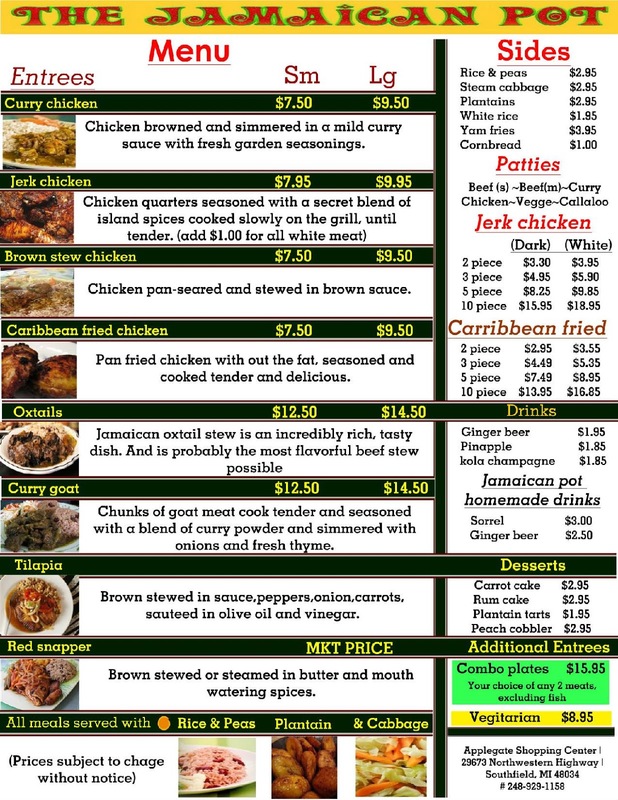 Because this was my first experience ordering Jamaican food, a staff member assisted me by explaining the different favors in the various entrees. His patience enabled me to select the perfect entree for my taste buds. 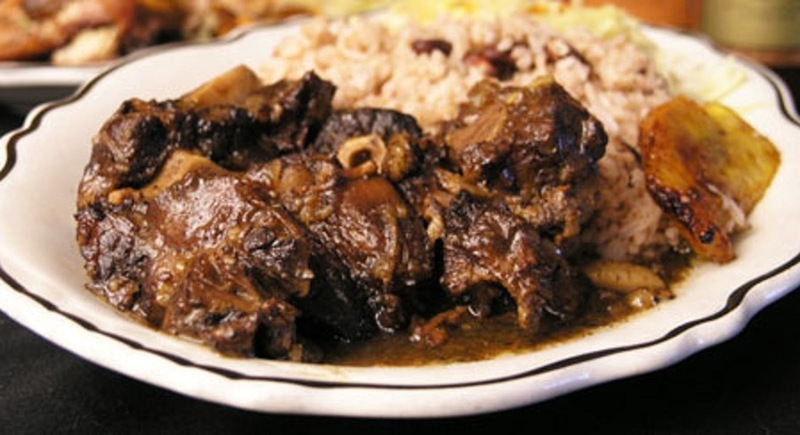 I ordered goat and ox tails. The meat was tender and the savory gravy definitely put this dish at the top of my best foods list. The food was delicious and I will absolutely recommend The Jamaican Pot Restaurant to all my friends.